We learned a couple of months ago that Bluetooth had been unlocked for Nook Color on a developmental level, but not until today has it been available for users. Developers fattire and verygreen have collaborated on a CM7 SD card bootable ROM that will let you sync your Bluetooth keyboard or headset to the "eReader." As trusted dev dalingrin noted earlier in our comments, the Bluetooth functionality has also been committed to the CyanogenMod 7 nightlies and is now available. It has hardly been perfected yet, as early reports are saying that the Bluetooth range is currently ranging from one to five feet, but the fact that these ambitious devs have taken this eReader one step closer to having full tablet functionality is quite impressive. The reason something as seemingly outrageous as Bluetooth on an e-reader is even possible is that manufacturers generally get better deals on Wi-Fi chips that also have Bluetooth capabilities. If they have to pay more to get a Wi-Fi-only chip, it's more economically sound to go with the Wi-Fi + Bluetooth chip, and simply deactivate the Bluetooth functions on a software level. This leaves room for the development community (in this case, fattire and verygreen) to re-activate it. 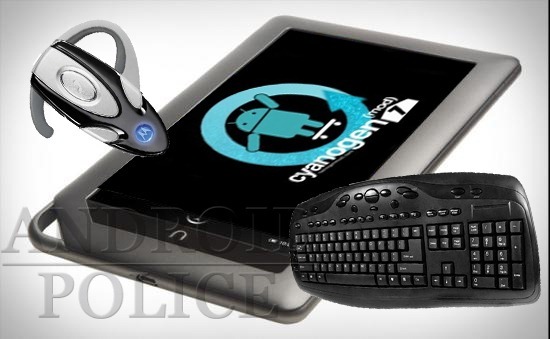 The image is based on CyanogenMod 7, which is based off of Android 2.3 'Gingerbread.' Gingerbread is the first Android version to integrate native SIP calling (when registered with an SIP provider, such as Sipgate). Nook users will now have this functionality in their makeshift tablets. Get an SD card, at least 4GB. Using an SD card reader, insert it into your computer. download WinImage, and under ‘Disk’ choose "Restore Virtual Image to Physical Drive." Choose your SD card reader’s drive. Change the files shown at the bottom to "all files" and select the file. To flash the latest nightly to the Nook's internal memory, download the latest CM7 nightly build and follow these instructions. You can find more info at the developer's thread and at the CM7 development thread.